Meadow Whiting’s 6-foot frame makes her appear to be quite the imposing figure. However, the soft-spoken sophomore for the Wilmington High girls basketball team is anything but imposing away from the court. A well-rounded athlete and self proclaimed “country girl,” Whiting is starting to make a name for herself on the court. 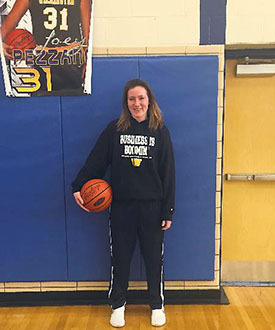 Her 19-point, 21-rebound performance for the Lady Greyhounds in a 50-39 victory over Lakeview earned her New Castle News Athlete of the Week honors, presented by Washington Centre Physical Therapy and voted on by the New Castle News sports staff. “Meadow has really come into her own as the season has gone on,” Wilmington first-year coach Rick Holzworth said. “She had some injuries and some obligations early in the season that caused her to miss some time. On top of that she was really still learning how to play. “Now the distractions are behind us, she’s learning how to play, the footwork has improved and she’s on the court. So, subsequently, the world can see what Meadow can do,” he continued. The obligations that Holzworth mentioned included a state square-dancing competition where Whiting’s team was crowned champion. She also competes in horseback barrel racing. Whiting says that growing up on a farm and having that outlet aids her in her basketball pursuits as well. Over 18 games played this season, Whiting is averaging 8.2 points per game. In her last six contests, she’s averaging 12.6 points per contest. She noted that she credits Holzworth with much of her development. “Over the summer, I played on an AAU team where he was an assistant so I kind of got a feel for him,” Whiting said. “When I found out he was the high school coach I was excited because I knew how good a coach he was. I like the way he coaches because he’s all about individual skill development. He knows we need to work as a team, but he realizes that we each need to get better individually for that to happen. Whiting added that one aspect of her game she’s looking to improve on the court is her confidence, which she says has been aided by playing with seniors Lauren Frederick and Reilly Hunt. “I sometimes just kind of feel like I’m not doing a lot out there,” she said. “Lauren and Reilly have helped with that, but I still need to work on being confident in myself, and seeing the numbers and stats that coach gives to us helps me to realize that ‘hey, I am contributing to this team.’"
As Whiting’s confidence begins to grow to match her stature, she’s becoming one of the county’s best players.